Kids and bubble wrap go together like peas and carrots, so any children’s craft project the utilizes bubble wrap as a central supply is sure to be a hit! 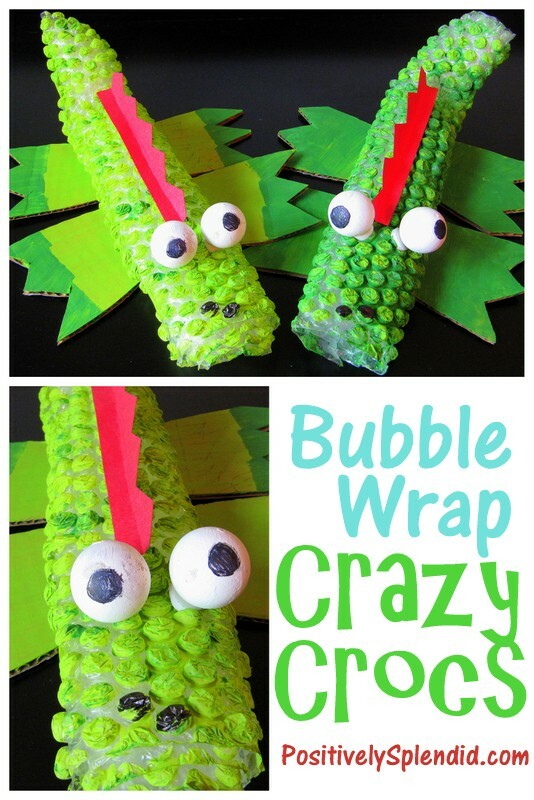 These Bubble Wrap Crazy Crocs are a fantastic kids’ craft to do to while away an afternoon. And the end result is too adorable to resist! Read on for all of the details. 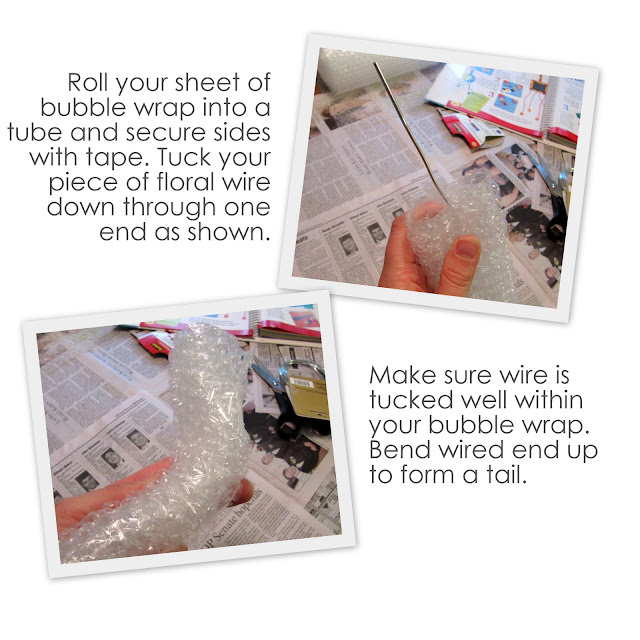 Roll your sheet of bubble wrap into a tube and secure sides with tape. Tuck your piece of floral wire down through one end. Making sure the wire is tucked well within the bubble wrap, bend wired end up to form a tail. 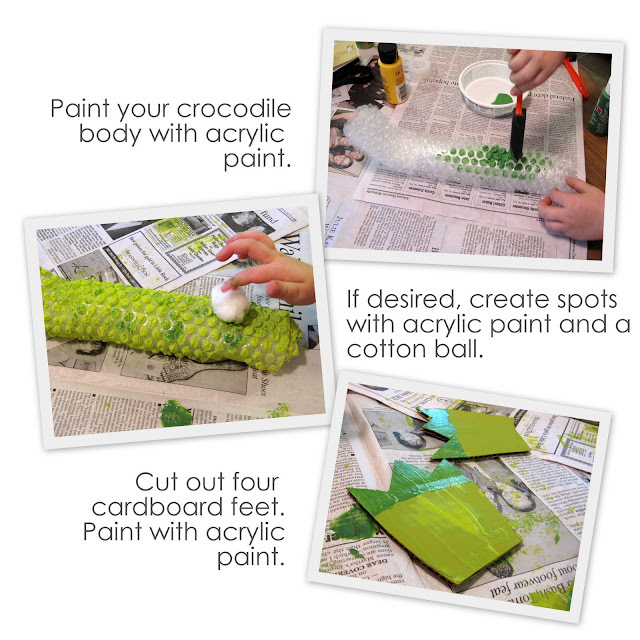 Paint the crocodile body with acrylic paint. If desired, create spots of a different paint color using a cotton ball. Allow paint to dry completely. Cut out 4 cardboard feet, and paint with acrylic paint. Allow to dry completely. 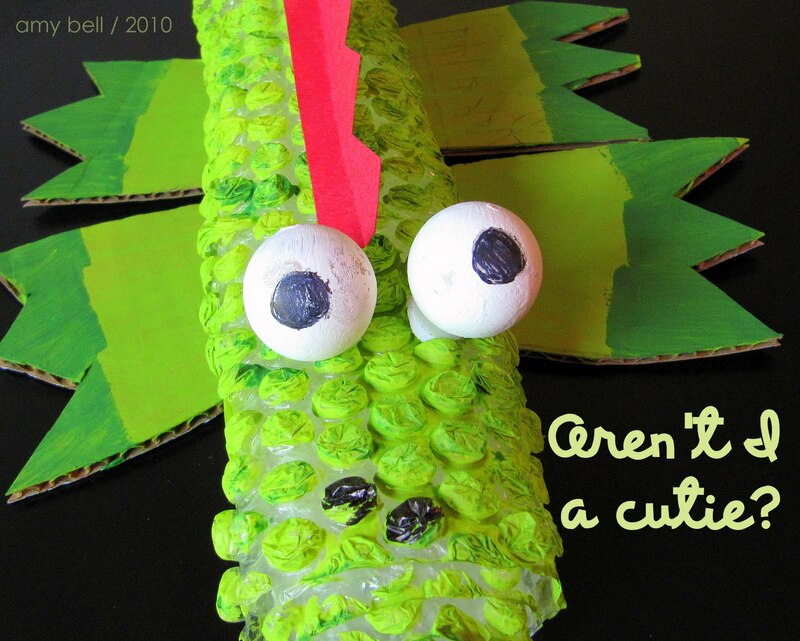 From red construction paper, cut out a frill. Fold over the bottom edge. Adhere the frill to the back of the body with craft glue. Paint 2 Styrofoam balls with white acrylic paint and allow to dry. With the black paint pen, draw 2 circles at the center of each ball to create the crocodiles eyes. Adhere eyes to the body with foam dots. …gather all supplies and place in one location. …cut out the bubble wrap rectangles and the cardboard feet. …trace the frill shape onto the red construction paper for your child to cut out. Or, for younger children, cut out the frills yourself for easy assembly. 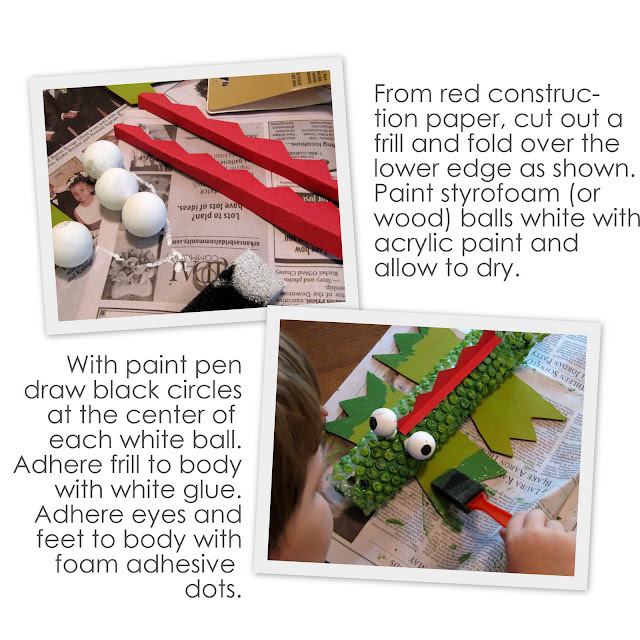 …consider painting the white balls to eliminate the need to let them dry the day of the craft. Those are seriously adorable! Thanks for sharing! very cute and a great way to recycle bubble wrap. What a great idea! I’ve got a whole bag full of bubble wrap I’ve been keeping to do something with…. Oh my goodness! These are awesome. So much fun – my girls are going to LOVE this. Now I’ve got to get my hands on some bubble wrap!!! very cute! My boys would love to make these. they are hilarious!I want one! Cute crocs! You’re more than welcome to put my attempt at your silhouettes on your blog! I’ll keep checking back for more good ideas! Seriosuly, so cute…my kids would love these. Adorable and creative! Very cute, and love the sanity saving ideas! Oh those little guys made me smile! What a fun way to recycle bubble wrap. I came over from Delicious Ambiguity. Your blog looks awesome. I’ll have to follow and join your blog frog. Nice to “meet” you, Amy! That is adorable. I’m going to have to file this away from when my son is a bit older. Thanks! This is one of the most creative kids crafts I’ve ever seen. I love it! Thanks so much for sharing, I’ll be linking. Thanks for linking up to Tot Tuesdays! I featured you last Tuesday. Feel free to grab my featured button. Have a great week! wonderful! I used your project to start off my crafty linking party last sunday but at the time couldn’t leave a comment because of some unknown technical problem, so I’m stopping by again to let you know (hope it’s okay!) and I’d love it if you’d drop by my party this week and share one of your great projects! hope to see you there, all the best! your idea is great but we can also use corn. if anyone is not having bubble sheet they can can have empty corns. what do u say? ?